Update: a number of you have been arriving to this page after searching Google for tips on "Porsche 911 CIS Modifications". While we have done some work to our '73 911T with CIS, we are by no means experts. However, we wanted to point you to a book that might help you in your research. How to Rebuild and Modify Porsche 911 Engines 1965-1989 . Written by Wayne Dempsey of Pelican Parts, this book provides a very thorough overview of Porsche engines, how to rebuild them and what you can do to modify them. We hope it is helpful. Now, on with the article. "to look like a '77, but have the ability to hang with a modern 'vette or anything else that might take it for granted." As the pictures below show, the car is in nice cosmetic condition (we love the Minerva Blue exterior) and currently runs well. The owner is looking for suggestions that will give him the best bang for the buck while meeting his stated goal(s). Personally, we're not huge fans of modified Porsches (we're purists by nature) but have no problem with what others want to do to their own cars. The 2.7 liter, normally aspirated, motor produced 157 hp and a top speed north of 130 mph. Curves were carved using a combination of MacPherson struts, shocks and anti-sway bars while stopping power was applied via vented disk brakes. Outside of the common problem of "pulled" cylinder head studs known to plague these magnesium blocked cars the '77 was a great car for the time and one that still represents a good bargain today. The owner of this car is looking for specific suggestions from other early 911 owners. Have any of you modified your cars? If so, what have you done? Are there things you've done that you now wish you hadn't? Conversely, are there things you didn't do you wish you had included? Let us know by commenting below or using the contact page to get in touch with us. 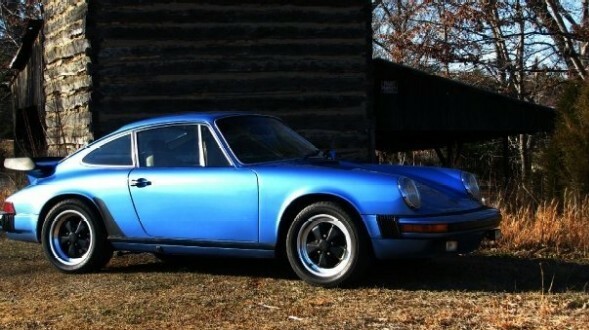 The 1977 Porsche 911 might be one of the least sought after 911 models due to documented engine issues. As such, I wouldn’t hesitate to modify the car accordingly to meet the goal. I agree, we’re talking at least a huge motor swap, and potentially forced induction to achieve that goal. It would be cool to keep the exterior as stock as possible to keep the car’s potential in sleeper status! Lighten the car as much as you can stand, interior bits, spare tire, etc. Put on a fiberglass ducktail or flat decklid. Those turbo tails are heavy. Swap in a good used 3.2 unit. Add a free flow exhaust. This will be the best bang for the buck option. But figure on at least $8k total. Swap in new rotors and pads. With the car being lighter you won’t have to go too big reds or anything. Can’t give specifics but lower it. Heavier torsion bars. Bilstien shocks. Good suggestions so far. I just received an email from another reader who asked a great question. What’s the budget? Caleb, care to weigh in on that??? 3.0 is the easiest,as you go up add into the fray ECU,MODULES ETC,HIGHER THE LITRE MORE THE WORK, A 3.0 IS A CLOSE TO A PLUG N PLAY AS THERE IS,THE 3.6 GETS THE HP ON. and i have already began to lighten the car. since i first got it, i have striped the car of about 200 lbs. if anyone has a great way of lightening the car, dont hesitate to tell me. thnx! have you had the car on the track yet? -IMO the best upgrade you can make regarding performance is seat time on the track. i have had it on the track a couple of times. the one problem i did face is the shifting times. if i could reduce shifting by half the time it now takes, that would be amazing! suspension is one area i was looking at as well. btw, could u elaborate more on the stand-alone ignition/fuel injection? im curious to know more about this. and what do u think of new cams? http://www.wevo.com will stop all your shift issues. One thing I learned while building my 993 is that you can’t just start bolting things on these cars and expect great results… I like to form a plan, save up, and replace a group of components all at once. Good Luck and welcome to the slippery slope! so do i just simply remove the CIS fuel injection on the car and replace it with that kit? also, what is fuel economy like with that kit? Having the 77″ model the one thing you could do is to make it look like a iroc 74 rsr just without the turbo look, but change the front and rear bumber, besides that you will save a lot of weight and dont compromise the originalitity, of the car, maybe a backdate of the heating system, and change the CIS to PMO MFI or PMO or Weber carbs. I have a 77 porsche 911 targa. I have had it since 1988. It is in great condition. Someone posted a question about what to do to a 1977 911 targa 2.7 to modify it. Anyone with this car should upgrade the chain tensioners to the oil fed carrera style. I keep my car mostly original although I upgraded to stainless steel heat exchangers and exhaust. It is also a good idea to change the original cooling fan to the type with more blades. Otherwise keep your car original. This is a fun car which is a blast to drive. Also, almost anything you need for this car is available new, aftermarket, or from a dismantler. The fact that these were 100 galvanized steel means no rust if you take care of it. I have a 77 911 that is a Sportmatic. I would like a good original engine manual gearbox. If this one is okay and coming out do you want to sell it?